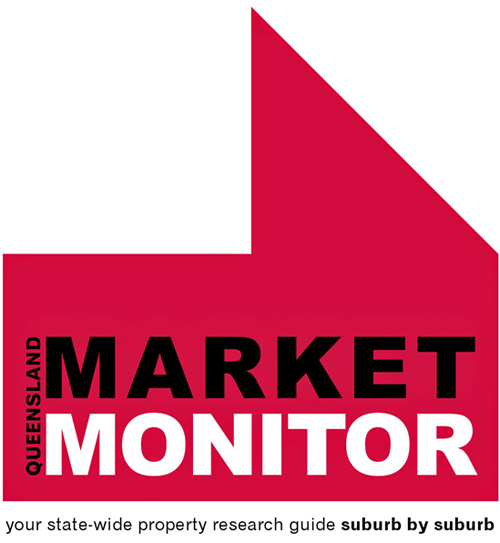 The Queensland median house price increased from $460,000 to $467,375 over the quarter. With the exception of Rockhampton, Gladstone and Fraser Coast, most of the local government areas in Queensland reported a median house price increase over the December quarter. Gladstone, Mackay, Rockhampton and Townsville have been the most affected areas and remain dependent on the mining industry to create economic development and to support job creation. 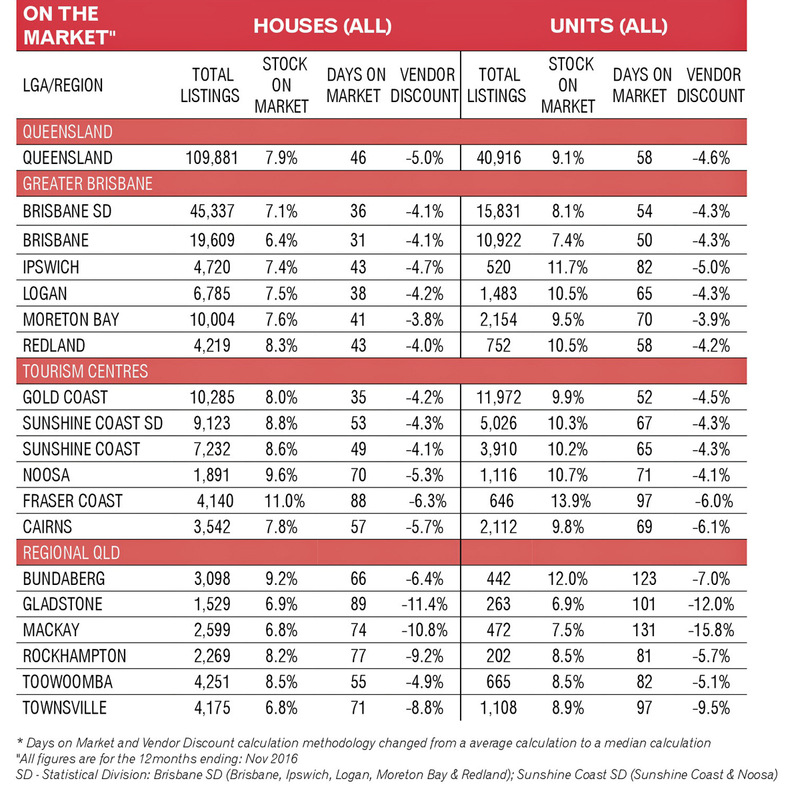 Despite the small size of the unit market in regional Queensland, units are generally struggling more than houses. Generally, infrastructure investment in regional Queensland is on the rise, particularly in Townsville, Toowoomba, Bundaberg and Rockhampton. Much of the region’s hopes are pinned on the success of the Adani mine. There are still a number of environmental issues pending which could delay or stop the construction and operation of the mine. Coking coal prices are also showing volatility in 2017, with the price per tonne falling to US$220 and a forecast price of US$160-US$170 per tonne in 2017. • $200 million to the Works for Queensland program to support local councils across the state creating jobs, maintaining and completing minor infrastructure projects. This funding is additional to the Significant Regional Infrastructure Projects Program, the Skilling Queenslanders for Work program, the Back to Work Program, and the first home owner grant. Similar to the current performance of the property market throughout the state, looking forward the prognosis of the market remains patchy and dependent on the success of the economic stimulation measures reaching the expected outcome. Fraser Coast is the one of Queensland’s most affordable regions, with a median sale price for the December quarter of $303,000, down from $310,000 for the September quarter. 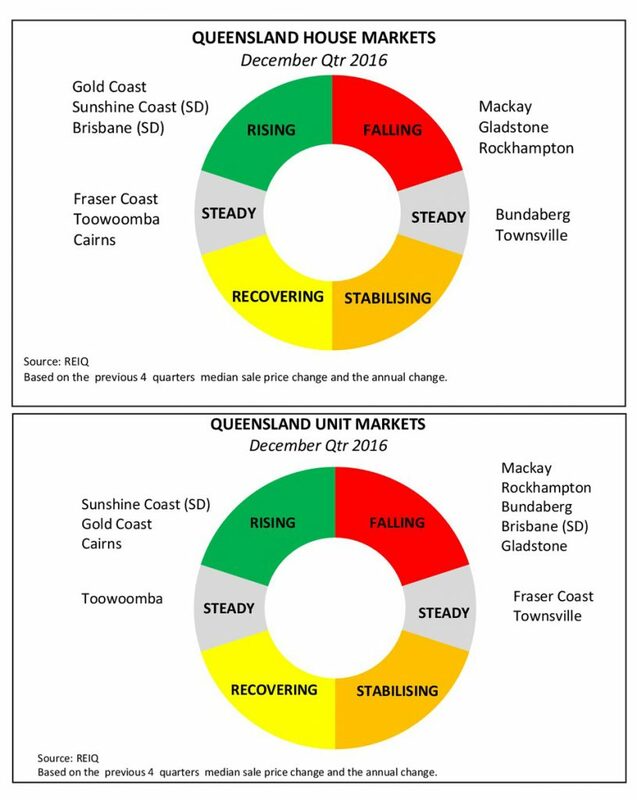 The current median unit price of $230,000 positions Fraser Coast as the fourth-most affordable region for units, following a contraction in the median sale price of about 6.7 per cent over the quarter. Fraser Coast remains heavily dependent on manufacturing and tourism for jobs and economic growth. The volume of infrastructure projects in Fraser Coast is limited, which does not support any potential improvement on the residential property market. Vacancy rates in Fraser Coast have been volatile in 2016. Maryborough recorded a large increase in vacancy rates from 2.4 per cent in September to 5.6 per cent in December. On the other hand, Hervey Bay’s vacancy rates were in the tight range at 2.3 per cent in December. The house market remained steady over the past 12 months, reporting an annual median sale price of $305,000 for the December quarter. Over the medium term, the annual median sale price recorded a modest growth of 7 per cent from $285,000 for December 2011 to $305,000 for December 2016. The largest volume of transactions for the housing market is focused within the price range below $350,000. Preliminary quarterly data for December indicates a fall in the number of sales from 421 in September to 287 in December. 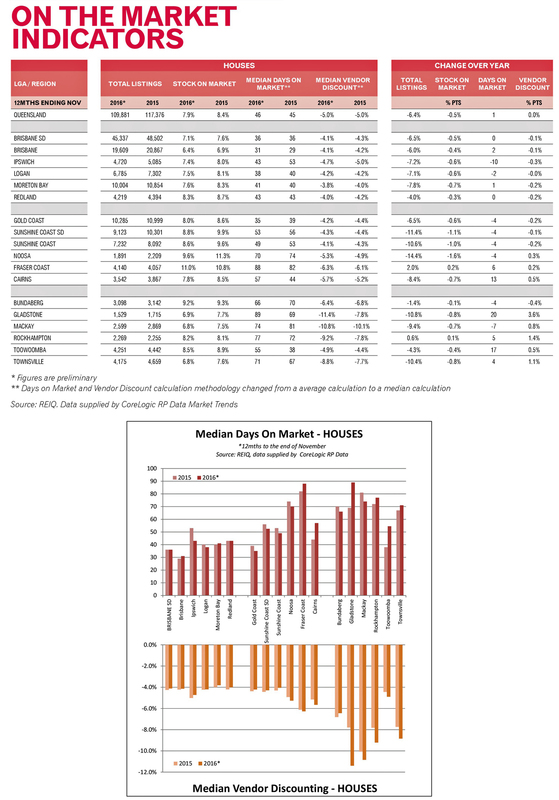 In contrast to the previous quarter, market trend indicators have recorded a slight increase in the number of listings and stock on market for the 12 months to November. This supports the increase in the median days on market for the 12 months to November, from 82 days to 88 days. Similarly, the median vendor discounting reflected a market providing more options to buyers with the median vendor discounting increasing from 6.1 per cent to 6.3 per cent for the 12 months to November 2016. 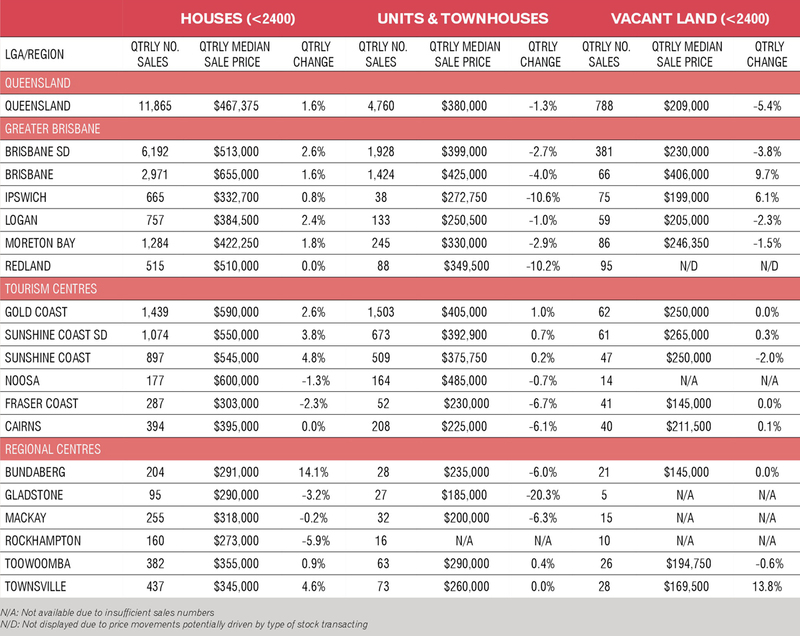 The unit market has followed a downward trend for the past three quarters, with the median sale price falling by 6.7 per cent from $246,500 for September to $230,000 for December. Despite this reduction, the annual median sale price increased by 4.9 per cent, from $243,000 in the December quarter 2015 to $255,000 in the December quarter 2016. Over the medium term, the unit market has remained weak with the annual median sale price falling by 8.7 per cent from $279,450 in December 2011 to $255,000 in December 2016. The listings volume and stock on market remained steady for the 12 months to November 2016. Median vendor discounting showed a modest improvement, falling from 6.3 per cent for November 2015 to 6 per cent for November 2016. 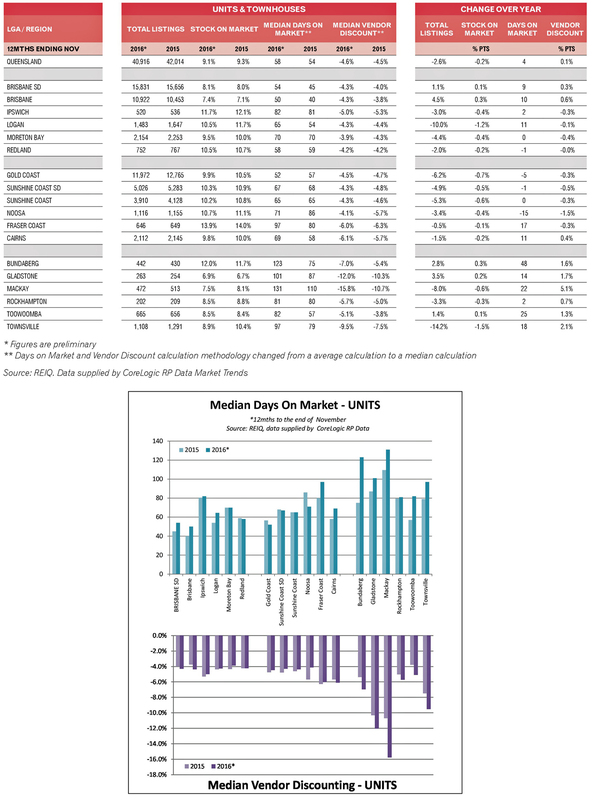 By contrast, median days on market increased substantially (longer than half a month) from 80 days in November 2015 to 97 days in November 2016. Fraser Coast’s vacancy rate has been somewhat turbulent recently, sitting at 3.3 per cent for December compared to 2.9 per cent for September. Maryborough rental market recorded the largest increase in vacancy rates over the December quarter of 3.2 percentage points, reaching vacancy rates of 5.6 per cent (primarily due to the excess of new houses in the region). The weekly median rent of three-bedroom houses and two-bedroom units increased by $5 over the December quarter. In contrast, the weekly median rent for three bedroom townhouses reduced from $330 for September to $315 for December. Local agents indicate that the rental market remains steady, however, the increase of new houses is causing a temporary increase in supply of rental properties.